The sternum or breastbone is at the center of the chest and when you feel pain below it, some type of disorder in the abdomen may be present. Such pain may be mild or moderate or severe. Symptoms and treatments may depend on the specific cause and tissues involved. Read on to learn different causes of pain below sternum and how you can deal with each condition. What Are the Possible Causes of Pain Below Sternum? Inflammation or irritation of the esophagus occurs when stomach acids flow back to the muscular tube that conducts food from the mouth to the stomach. This can cause upper abdominal pain, pain below sternum, difficulty swallowing, cough and hoarseness. Factors that increase the likelihood of esophagitis include smoking, alcohol drinking, vomiting, and some medications. How to Get Relief: treatment includes intake of antacids or other medications to reduce stomach acidity, and antibiotics to treat possible infection. Smoking and alcohol intake must be avoided. One possible cause of pain below sternum is heartburn or indigestion. 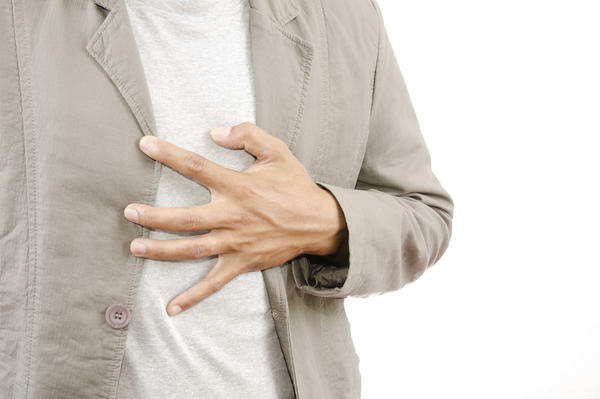 Episodic upper abdominal pain in the chest may be a result of GERD or gastroesophageal reflux disease. Heartburn usually causes a burning sensation in your chest but can radiate pain to lower sternum, which is more common when you become pregnant. Other symptoms include bitter taste in throat or in mouth. Different forms of respiratory disorders, such as inflammation of the lining around the lungs, a blood clot traveling to the lung, pneumonia, asthma, and bronchitis can cause pain below sternum or chest pain. Other symptoms include cough, difficulty breathing and fever. Diagnosis depends on medical history, physical examination and appropriate laboratory examinations, such as chest X-rays and pulmonary function tests. Treatments: treatment depends on the diagnosis and may include antibiotics, bronchodilators, and deep breathing exercises. Smoking can aggravate the problem so you should quit smoking. Excessive stress can damage the structure of your abdominal muscles and cause strains. Characterized by tiny tears or rips, these strains may lead to some discomfort or pain below sternum. When damaged muscle fibers are pulled away from each other, muscle rupture occurs, causing severe pain. Overexertion of abdominal muscles occurs when you do a sudden activity, exercise excessively, perform exercises improperly, lift heavy objects, or twist the body sharply. How to Get Relief: to relieve the pain after the muscle injury, you should stop doing the activity that causes muscle strain and rest as needed. A cold pack may be applied for 15-20 minutes four times daily for 2 days. Pain medications like ibuprofen or acetaminophen may be taken. Gentle stretching exercises may be done when your pain subsides. However, if your pain does not improve in a couple of days, you must call the doctor for an appointment. Inflammation of the pancreas, an organ located behind the stomach in the upper abdomen, can cause acute pain below the sternum when its enzymes are abnormally activated due to some factors like alcohol abuse or blockage of its ducts. Injury, certain medications, certain diseases, and high blood levels of triglycerides and fats can also lead to acute pancreatitis. Symptoms include severe upper abdominal pain, which radiates to the back and worsens when lying down, indigestion, clay-colored stools and abdominal swelling. Treatments: treatment requires hospitalization to improve hydration, administer pain medications, suctioning of stomach contents and refraining from taking food and drinks. Surgery may be needed to remove infected or dead pancreatic tissues. Infection or pneumonia in the lower lobe of the lungs can produce pain below the sternum similar to that brought about by collapsed lung. The pain may also be felt in the right or left upper abdomen. Other symptoms include cough, fever, and pain with coughing. Treatments: treatment includes use of antibiotics and depends on the cause of the pneumonia. Pain in the chest or below the sternum may be due to a fracture of the sternum, which can be caused by motor vehicle accidents, when the chest hits the steering wheel. Immediate medical consultation is necessary to evaluate for other internal injuries. Other important factors that may cause pain below sternum include excessive belching, lung abscess, hiatal hernia, and stomach ulcers. Uncommon respiratory conditions such as lung cancer and tumors in the respiratory passages may also trigger discomfort and pain in this area. There are many possible causes of upper abdominal pain or pain below the sternum. Aside from taking a medical history and conducting a physical exam, healthcare providers may order some diagnostic tests to help confirm the diagnosis. These include blood tests, chest X-ray, magnetic resonance imaging (MRI) and computed tomography (CT) scan. It is always best to seek medical consultation, especially when the symptoms do not get better with over-the-counter medications or other home remedies.